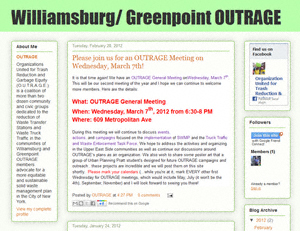 OUTRAGE is a coalition of more than two dozen community and civic groups dedicated to the reduction of Waste Transfer Stations and Waste Truck Traffic in the communities of Williamsburg and Greenpoint. OUTRAGE members advocate for a more equitable and sustainable solid waste management plan in the City of New York. sports asthma rates well above the norm. has seen a disturbing increase of pedestrian/motorist accidents as a result of this traffic and a woeful lack of enforcement. OUTRAGE addresses just these things— and a lot more! But this post is not about the manifold number of environmental issues in our community. Instead, they need help of a highly specialized (and preferably free/cheap) nature. Which brings me to the image gracing this post: it is a screencap culled from OUTRAGE’s site on Blogspot. Simply put, they want to step-up their online presence in the hope they can more reach people. People like you and me. And to this end they need the help of a good Samaritan to design a web site for them. Trash talk seldom is (or should be) pretty. Instead, this is an opportunity to help a wonderful coalition of organizations build a web site that is user-friendly, author-friendly and informative. Those of you who have the skills to make this happen can contact Courtney via email at: crenken (at) stnicksalliance (dot) org. 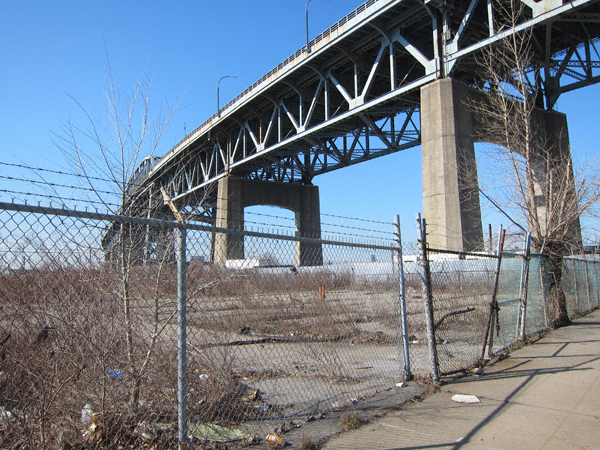 The land gracing the Queens side of the Kosciuszko Bridge. If implemented this will abut proposed park space and a kayak launch. Nice, eh?